Digital signal processors (DSPs) don't get always get a lot of attention, but they're critical for determining the speed and efficiency of many of the gadgets we use, from mobile phones to media players. Researchers at the University of California have just announced the development of a new kind of a DSP that squeezes 167 processors on a single chip, working up to ten times faster than traditional chips, and using a fraction of their power. 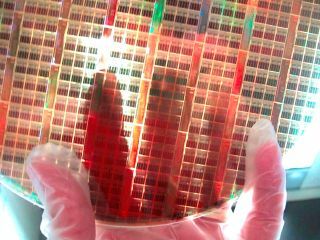 Twelve of the new AsAP chips working together could perform more than half a trillion operations per second (.52 Tera-ops/sec) while using less power than a 7-watt light bulb. "A battery powering this chip will typically last up to 75 times longer than when powering some common digital signal processing chips," said Bevan Baas, associate professor of electrical and computer engineering and leader of the design team. "At the same time, we're getting up to 10 times better speed than what is currently available, all with a much smaller chip." Baas' group has written a number of software applications for the chip, including a fully-compliant Wi-Fi transmitter, a Wi-Fi receiver and several complex components of an H.264 video encoder. After testing the chip extensively, it has worked without a glitch, Baas added. Better yet, the chip can be built with industry-standard fabrication technology and design tools.